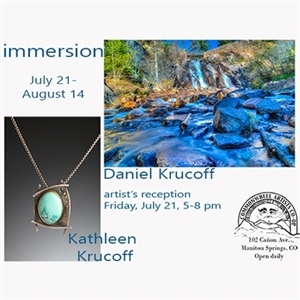 Description Dan and Kathleen Krucoff work in different media—Dan is a photographer and Kathleen is a metalsmith and jeweler. They have longed to do a joint show featuring their artwork. Dan came up with the idea for “Immersion” to allow them to relay their love of the water-infused sights in Colorado and other areas they have visited through their respective media. Dan’s work in the Immersion show will consist of digital landscape photography with water as a central theme. From drops on leaves to ocean vistas, along with roaring waterfalls to still pools, he explores water in its natural forms. His goal is to leave the viewer with the feeling of being in these remarkable, inspiring places. The primary focus will be areas around the Pikes Peak region, but will also include subjects from other parts of the state and country. As Kathleen began to develop new works for this show, she sought and found stones that represent water to her. Some pieces incorporate lush green Ocean Jaspers that remind her of ocean waves, other stones such as Leland Blue or Larimar evoke images of ponds and tranquil lakes. Kathleen has employed a variety of metalsmithing techniques such as Chasing and Repoussé to create seashells. She has set gemstones like emeralds, sapphires and topaz, with gold to compliment her pieces. By using a number of textures she has created sandy backgrounds and sea trails in her works. Celebrate with the artists at our opening reception on Friday, July 14, as part of the Manitou Springs ArtWalk. Add Immersion to your free online travel itinerary.